In the 2000 movie Running Mates (2000), Faye Dunaway's character observes that the only thing anyone ever named for a first lady was a rehab center. Louisa Catherine Johnson (Mrs. John Quincy) Adams, who did volunteer at a mental institution, entitled her memoir of being a first lady The Autobiography of a Nobody. The women of the American presidencies are an institution who often could have used an institution. Mary Todd Lincoln famously spent time “incarcerated for several months [for insanity],” and Jane Appleton Pierce was a manic depressive and a hypochondriac. Some of them, including Helen Herron Taft, Ellen Axson Wilson, and Betty Bloomer Ford entered the White House with severe health issues, and other FLs left with problems, including substance abuse. The only permanent exhibit to the first ladies (in the Smithsonian) focuses on their clothes, and even the mannequins are not representative of the actual women. Only three ships have the name of a first lady. These unique, very different, and special women deserve to be better remembered for their sacrifices and service. The C-Span network conducted a series of interviews with historical authorities about the often celebrated, sometimes maligned, and otherwise ignored public hostesses of presidents of the United States. This history is timely as it is possible that a former first lady may become President of the United States in 2016. That enough qualified commentators could be found to intelligently comment on these special individuals is a remarkable feat. Many of the sketches have academic value although that is diminished by the book having an inadequate index. This compilation is revealing while also riveting. It challenges much in American popular history while it also derives much of its power by the experts, two for each sketch, speaking informally. Jacqueline Kennedy and Hillary Rodham Clinton are treated perhaps too negatively, but a few other accounts read like PR press releases written by persons too sympathetic and more partisan than scholarly. Not all first ladies were president’s wives and not all consorts of later presidents would become first ladies. Jefferson, Jackson, Van Buren, Arthur, and Wilson (at least for a time) were widowers. Daughters, nieces, and friends filled the position of first lady. Margaret O’Neill Eaton was the famously maligned wife of a cabinet member whose defense by President Andrew Jackson became a political crisis. She is included in this book. As pointed out in the movie The American President (1995), the United States does not have a “First Mistress” although that matter is brought up in this volume and names are mentioned. No discussion, however, is offered on bachelor President James Buchanan’s alleged relationship with William Rufus King or of Thomas Jefferson and his slave Sarah Heming. A few words about the African American wife of President Van Buren’s Vice President Richard Mentor Johnson might have been included. She was only a heartbeat away from being America’s first black first lady. Confederate President Jefferson Davis’ wife Verina Banks Howell is also not included. 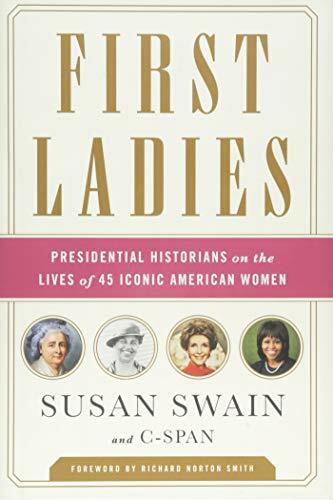 In the foreword to First Ladies, presidential historian Richard Norton Smith wrote more than once that “it costs to be first lady.” He, however, failed to mention the death of the spouse in office and being left alone and sentenced to president’s widow for life. Mary Todd Lincoln and Jacqueline Bouvier Kennedy watched as their respective husbands were assassinated. Each had lost a child while first lady. That so many of the first ladies lost children, Edith Mayo explains about Mamie Doud Eisenhower, “is a recurring theme . . . it is always a horror story.” Frances Folsom Cleveland had reason to fear for her children being kidnapped. Caroline Scott Harrison, Lucy Webb Hayes, Lady Bird Taylor Johnson, and Laura Welch Bush became first ladies under controversial or questioned circumstances about their respective husbands becoming president. Edith Bolling Wilson was accused of acting as president for her disabled husband. Patricia Ryan Nixon and Hillary Rodham Clinton had to suffer through their husbands’ all too public failures. They had to be “the good wife” in the public eye despite spouses who callously lied to them. Mary Todd Lincoln and Patricia Ryan Nixon were literally in war zones during their respective times as first ladies. Women of the White House spent time helping in hospitals during their respective presidents’ wars or in earlier conflicts. These sketches from Martha Dandridge Washington to Michelle Robinson Obama are not dry annotated history. Susan Swain’s carefully edited insights should carry a warning that reading one interview can lead to reading all of the others nonstop. Much is learned by reading the book as a whole. Betty Boyd Caroli noted that many of these women “married down” in choosing their men who later, often surprisingly, became President of the United States. Mary Lincoln and Julia Dent Grant, ironically, came from slave holding families and Julia unapologetically so. This book is a dark history of how far medical science has come. Several first ladies, including even Martha Washington, were from families of modest means. Many of these women lost one or both parents while children, uncommon even in the early republic. Some of the couples who occupied the White House lost their marriages to the presidency as with the Lincolns and the Nixons. Others of these special relationships were political partnerships such as the Madisons, Polks, Hayes, Tafts, Wilsons, (Franklin) Roosevelts, and Johnsons. Many of these greatest of the United States’ power couples held strong views on civil rights, prohibition, race, and other sensitive issues of their times that they could only quietly support. On women’s rights, however, the first ladies consistently tended to be behind in accepting the changing times and increasingly progressive public attitudes. Some first ladies refused to be silenced by their sensitive political position including Betty Ford, Barbara Bush, Laura Bush, and Michelle Obama. First ladies Betty Ford and Barbara Bush were more popular during their time in the White House than their husbands. Eleanor Roosevelt is now remembered as one of the great Americans but head of the FBI J. Edgar Hoover wanted to have her declared “colored,” stripped of her citizenship, and exiled to Liberia. First ladies, starting with Abigail Adams changed the history of the building eventually known as the White House. This book is an epic tour of that home and institution. Dolly Madison, Helen Taft, Lady Bird Johnson, and Eleanor Roosevelt made their mark on Washington as a whole. Julia Gardiner was the first successful volunteer for the position when she married widower President John Tyler. Bess Truman, Pat Nixon, and Betty Ford, among others, did not want the job. Thomas Jefferson and Chester A. Arthur essentially had no first ladies. John Quincy Adams' wife Louise Catherine Johnson spent their whole marriage as a politician's wife that included a trip in the dead of winter from St. Petersburg to Paris in a sled almost alone except for their seven-year-old son. Elizabeth Kortright left a comfortable life in New York to put up with rural Fredericksburg, Virginia; Paris at the height of the Terror; and still later in the White House after it had been destroyed in the War of 1812 to be the wife of James Monroe. Martha Washington and Anna Harrison were literally camp followers in the best way. Eleanor Roosevelt saw more carnage on battlefields in the First World War than her husband Franklin could ever have imagined. Lou Henry Hoover “manned” barricades in China during the Boxer Rebellion. Nancy Reagan first met Ronald Reagan when she was blacklisted on accusations of being a Hollywood Communist. She asked him, at that time a liberal Democrat, to intervene. Frances Folsom Cleveland was twenty-seven years younger than her husband and married him in the White House. She had the only child born there to a first lady and was so popular that the Baby Ruth candy bar was named for their child. Overall, this compilation is revealing while also riveting. It challenges much in American popular history. Jacqueline Kennedy and Hillary Rodham Clinton are perhaps treated too negatively but, in a couple of places, the discussion reads like PR press releases written by persons too sympathetic and more partisan than scholarly. My final question is which actresses will play which first ladies in the epic television mini-series that I hope will be made from this book!